Scheduling in a special education classroom (next to organization) is one of the most important things. It can get a little complicated, but stick around and lets walk through it together. 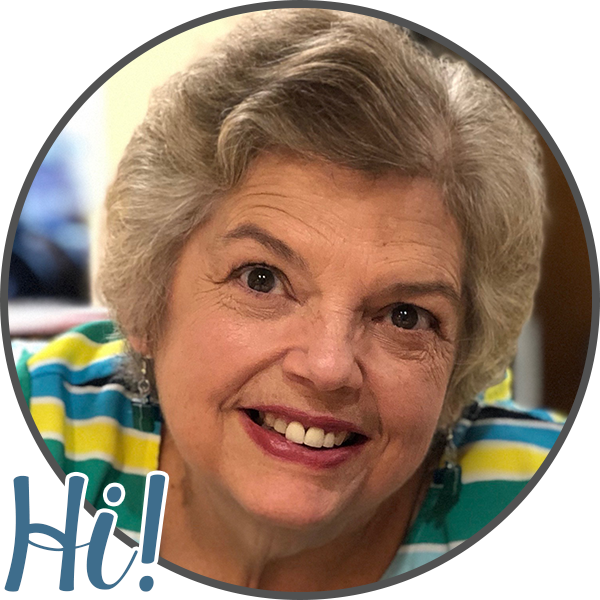 I spent many years being the only special education teacher at a small neighborhood school. I had no one to bounce ideas off or share ideas. I only wish the internet was available then ( yes, I've been around that long) so I could see what others were doing . 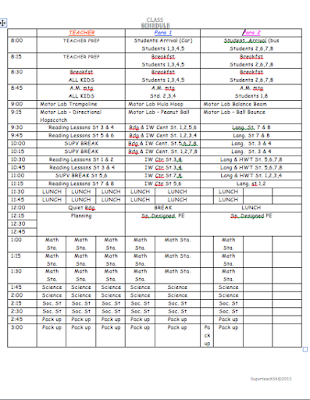 So stick around and let me share a little of how I schedule my classroom. It is my hope that some of what I do can help you or give you an idea of ways to make it easier for you. Step-by-step and piece by piece it will come together. 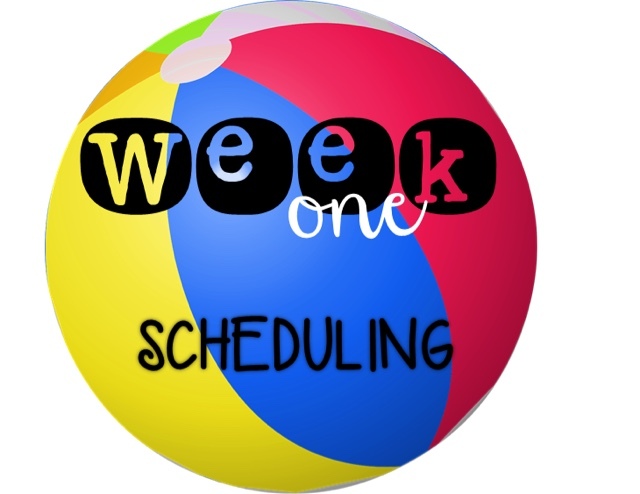 There are so many different factors to consider when scheduling in a self-contained special education classroom but we will consider just the basic starting points in this post. Assemble all your information regarding what your students needs are. Read your students IEPs to get their goals and objectives. Tracking the students progress throughout the year is imperative so the first thing is to look at goals and objectives for each student. Ask yourself: Where am I going to start with each student? What is my next step academically and behaviorally as well as in the areas of social skills, independent functioning and health issues(if any)? What related services do your students receive? Do your students receive Occupational Therapy, Speech/Language Therapy, Physical Therapy? What special activities such Art, Music, Computer do your student attend? And of course, don't forget Lunch and P.E. Once you have all your information about your day (or as close as you can get), move on to the next step. I use 2 primary schedules to map out my classroom information each year. Color code. Color coding for my classroom makes me calm! Then when it was more manageable (in MY mind) a.k.a the schedule was about 80% done I would do it in excel or in a chart in Word. The first is a CENTER ROTATION schedule of when activities are held during the day and what station each student goes to. For example, Student 1 goes to Reading Station from 8:45-9:00 and Student 2 goes from 9:00-9:15. With times down the left side in increments of 15 minutes and student names across the top. I complete this schedule first in order to make certain every student is assigned each station and there are no overlaps. This chart tells which staff member works with which student(s) at what time. With this chart I can make sure all student have supervision, Paraprofessionals have their breaks and all areas of the classroom are covered. 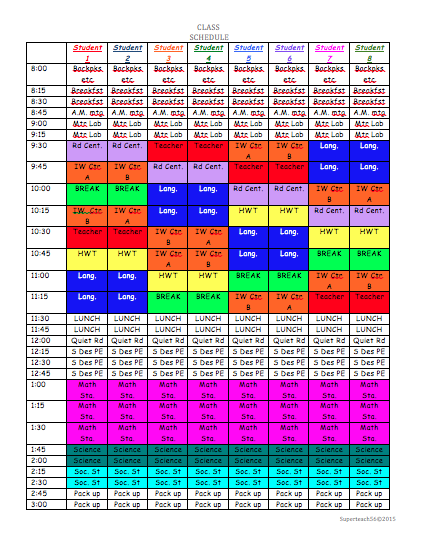 I prefer to use color coded schedules myself as the color gives me one more way to organize my thinkings and see the classroom organization at one glance. I created an IEP goals/objective form, that my paraprofessionals and I use to track the student's progress. It lists the goals and objectives down the left side of the chart and a place to record the data for each; whether that is trials correct or percentages. I was lucky for the last couple of years to have a fairly stable class in which 95% of the students returned to me each year, so I was aware of their skill sets, their goals and objective as well as their limitations from the day they walked back into my room, yet I still made sure I had these charts. I have included both color and black and white forms in the pack. Below you'll find a link to several of these forms that I've used in the past. I have left them totally editable in MS WORD format so you can modify them to make them your own. Thanks to Kim Geswein fonts. Continue your travels to the next Summer Bloghop site by clicking below. Thank you for sharing how you schedule your students and paras. 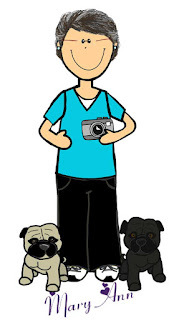 It is so helpful to see how other special educators complete basic classroom management jobs.. I love how you organized this post into the ABC's of scheduling! Clever! Thanks for the freebies! I also love the ABC acronym...super easy to remember. Great tips! I love how you organized this post and shared the ABC's of scheduling! So easy to remember and share with others! Thanks for sharing this information! It really inspired me to jump in and schedule, schedule, schedule! Naturally encourage the process of overall weight reduction.